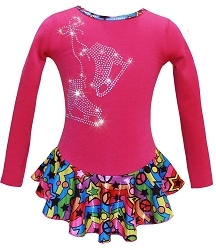 18 Inch doll ice skating dress with rhinestone "star" design fit American Girl Doll. Doll dress made out of exact the same fabric like a girl ice skating dresses. . Ice skating jacket sparkles on the back with "Skate" applique and rhinestones around. This dress are great match to our pink ice skating dress for girls. Ice skates and crown not included in the set.